The love of doughnuts is a nearly universal thing. Statistics show that 91% of all Americans either identify as liking or loving doughnuts. By the way, who are these other 9% of people and what is wrong with them? It’s that jolt of energy designed to kickstart your day and every office has a box or two lying around once a week. But where does one go to get the ideal doughnut for either your coworkers or that key customer or prospect you’re looking to impress? According to Yelp, St. Louis was voted the #2 food city in the country and our local doughnut shops are a huge reason why. Most of us have a specific place we prefer, whether that’s based on a childhood memory, location in relation to home or for a particular choice that can only be found there. Over the last month, I listened to you, the people, and hit St. Louis’ most popular doughnut shops as I painstakingly collected data. Having spent the last twelve months on a rigorous keto diet, I pushed my body to the brink of diabetes and a constant threat of sugar coma as I traveled north, south, east and west through my culinary journey. So, without further ado, here is the very scientific, totally definitive list for your eating pleasure. Dating all the way back to 1952, Donut Drive-In has been a staple of the St. Louis community with its no-frills, classic nostalgia donuts that’ll instantly take you back to the era of sock hops and Elvis Presley. Located 6525 Chippewa Street, you’ll be able to find any of your traditional favorites and even some offerings that very few make these days. Whether you’ve been stopping in after Sunday mass for the last 40 years or are a first-time customer, expect to be warmly greeted by a staff (shout out to Cindy, Cheryl & Justin) that will make you feel right at home. Standouts from the menu include a wide array of Long John’s, a crispy, crunchy & fruity apple fritter and a hand-rolled old fashioned that balances sweetness and texture to perfection. 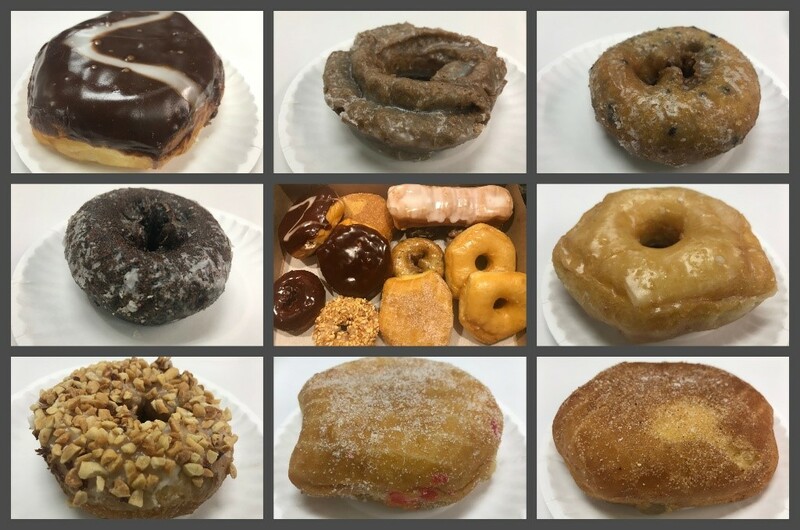 Best Office Application: Win over an office department by picking up a large box (3 dozen donuts) of time-honored treats that’ll either take someone down memory lane or open their eyes to one of St. Louis’ longest-standing donut shops. Family-owned since 1968, Old Town Donuts has the distinction of being voted Best Donuts in St. Louis by the Post-Dispatch for 2018. The original location in Old Town Florissant has been a staple of the community for decades and is a shining beacon of sweet goodness 24/7. That makes it the go-to location for those that burn the midnight oil and are looking for a place to grab a bite at all hours of the night. A second location in Cottleville opened in 2014 and drew the eyes of a new section of St. Louis that may not have enjoyed the homestyle charm otherwise. Old Town says save those fancy donuts for someone else. They happily do the classics to perfection and when you’ve been a successful business for over 50 years, why change now. Their selection of donuts is highlighted by a glazed donut engineered for dunking in coffee, a creamy & rich old fashioned that takes you back to being a kid and filled choices ranging from custard or cream to fresh apple and jelly. Best Office Application: Great for ordering a couple dozen to share amongst a large department that value old school donuts and enough classics to make your head spin. 1968 clearly represented a landmark year for St. Louis donuts. While Old Town Donuts was getting started in Florissant, Paul & Marti Murawski were laying the groundwork for what’s become an institution in the St. Peters community. Paul’s Donuts is now under the guidance of owners Bill & Julie Feld since 2018 and in 2015 moved to a larger location just across from where the original stood. Much Like Old Town, Paul’s is steeped in tradition with their classic assortment that instantly transports you to another place and time when things were simpler. Even though Paul’s does old school donuts well, they aren’t afraid to mix it up and offer choices that venture into the adventurous landscape. Whether it’s a Cookies & Cream filled chocolate donut, or a Mississippi Mud donut topped with marshmallow, graham cracker & caramel drizzle, this place will have you smiling from ear to ear. Best Office Application: Wonderful for mixing and matching a dozen or two donuts that balance the line between traditional fare and adventurous. Whether your office is packed with baby booming donut purists, millennials that want their donut to think outside the box or a little of both, you can’t go wrong with Paul’s. Entering the doughnut scene in 2017, Dapper Doughnut and owner Greg Markowitz are here to revolutionize the industry with a new approach to a traditional concept. Wanting to get out of the corporate world, but still clearly understanding what those in that setting value, Greg is offering hot, fresh mini doughnuts made to order and topped right before your eyes. These mini creations are crispy on the outside with a moist and pillow-like interior that melts in your mouth. Over a dozen topping varieties are available to choose from, highlighted by best selling Cinnamon Sugar, Blueberry Lemon & Cinn City. There are no wrong answers when it comes to topping choices with whimsical flavors and textures all working harmoniously alongside the pure doughnut taste. Best Office Application: The premier choice for an intimately sized office, but suitable for larger workplaces as well (including on-site catering for a truly unique experience). The miniature size of the doughnut encourages you to try a sampling of different flavors while still not feeling too guilty about the calories you’re consuming. The name says it all, really. Since 2013, owner Jason Bockman has been hard at work establishing Strange Donuts as the most creative and unique shop in St. Louis. With locations in Maplewood, Kirkwood and now Creve Coeur, it’s easy enough to get to one of their stores no matter where you’re located across the city. While Strange offers old school favorites like Glazed, Sprinkle and Jelly Filled, it’s their more outlandish custom creations that will capture your attention and speak to the imaginative kid inside of you. An ever-evolving menu keeps you on your toes, but some recent custom created highlights include Gooey Butter Cake, Chocolate Guinness, and the Majestic Unicorn Cinnamon Roll. Also, be sure to look out for their savory combinations which often are collaborative efforts with other St. Louis restaurants. Best Office Application: Ideal for that coworker or customer you’ve known for years who enjoys a fun, care-free donut experience. They won’t be disappointed when you show up with something colorful, decadent and over the top! In 2013, Vincent Brian Marsden burst onto the St. Louis doughnut scene by opening the first and only doughnut food truck in the city. Only two years later and on the heels of winning The Cooking Channel’s Donut Showdown, the operation moved inside as Vincent Van Doughnut opened their shop in Clayton (a 2nd location in The Grove wasn’t far behind). Every day, Vincent scratch makes their artisanal doughnuts, including the fillings, glazes, and toppings. Sure, you can go with something safe like their vanilla glaze, but why not forgo inhibitions and give in to your wilder side. Whether it’s a Samoa style doughnut that’s ooey-gooey and loaded with toasted coconut or a New York cheesecake doughnut with a cherry topping and actual cheesecake filling in the center, you’ll feel the love that comes from a product this fresh. Best Office Application: You’ve got a big meeting with a prospect and their executive team who you’re looking to impress. Bring a selection of Vincent Van Doughnut’s finest creations and win over the room before things even begin. Whichever you choose, you can’t go wrong — trust me. If you want to let us know who your favorite is, head over to our Facebook page and leave a comment on this post. Andrew is 33 years old. He was born in a town with a population less than 150 people, west of St. Louis, MO. He is married with a 1-year old son, Jude. Andrew was a self-proclaimed nerd before it was cool to be one, and is an avid fan of Liverpool Football Club, the St. Louis Blues & Los Angeles Lakers. He can name every Beatles album in chronological order of release. Marvel>DC, but Batman>Everyone. Andrew spent 10 years in restaurant management before joining Office Essentials as a Strategic Account Manager and Editorial Writer.